Once you start looking for products without palm oil, you will be shocked to learn how many contain palm oil derivatives. According to industry experts, palm oil is now in half of all packaged goods. It’s in hygiene items, cosmetics, and cleaning products. While it takes a little bit of work, especially at first, there are ways to find products without palm oil. This is essential. The International Palm Oil Free Certification Accreditation Programme in Australia has researched all the ways palm oil is used. 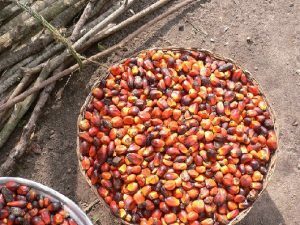 They have compiled a list of palm oil derivatives. Print and carry their list with you. Or access it from your phone before you buy anything. It contains the hundreds of ways palm oil is hidden in ingredient names. It’s in alphabetical order so you can somewhat easily check each label before you buy something. It’s important to read the labels of everything you buy if you are trying to avoid products with palm oil. Until you investigate further, you wouldn’t automatically know that ingredients like Vitamin A Palmitate — added to cereals to boost Vitamin A content to 10% or higher — contains palm oil. Manufacturers use palm oil derivatives in many ways and for different reasons. In addition to your list above, in time you will be able to scan for words and know that they contain palm oil derivatives. It will be easy for you to see “palm oil” and “palm kernel oil” spelled out in ingredients. Know to avoid anything with a Palm-. Here’s more information about names for palm oil. To learn how to find products without palm oil, you need to know places manufacturers use it. Often, companies change suppliers and ingredients. Nabisco now uses palm oil to make Oreo cookies; they didn’t always. In 2018, Peanut M&Ms started including palm oil. You will also find that some versions of the very same products will have different ingredients. Hopefully, more and more, companies will recognize that being palm oil free is considered something to promote and advertise. The first and currently only company to earn palm oil free certification status in the United States is Enjoy Life Foods. They will have eight products certified as palm oil free. Once you have found some products free from palm oil, it will get easier to know what to look for. After looking for 100% palm free products, you will appreciate the companies who don’t use it. Sometimes it will truly feel like a victory! Make a difference! Write them an email. Blast a positive note about them not using palm oil on social media. Buy their products. Remember to not purchase competing products who use palm oil. We want them to keep their products free from palm oil so be loyal to them. There are so many packaged foods, supplements, medicines, hygiene, and cleaning products with palm oil and palm oil derivatives. However, once you start knowing the types of ingredient names to look for, you will have an easier time of finding products free from palm oil. You can find products without palm oil. You have to actively be reading labels and comparing them to the list referenced above in order to avoid it completely. But once you are in the habit or reading labels, it is quick to find the ingredients to avoid. You will also used to choosing products with less ingredients overall. Additionally, you will know the types of products that use it. It’s in foods and self-care items you wouldn’t have ever considered. You are most likely using palm oil on a daily basis without realizing it. If you are avoiding palm oil because of environmental concerns or health reasons, you need to know how palm oil is hidden in everyday products. It will get easier when you know what you are looking for. Use these 9 ways to find products without palm oil. We are not medical professionals, and this is not meant to be medical advice. Please consult with your doctor.